About a year ago, my friend Berni showed me an article she'd read in The Guardian about quilter Cassandra Ellis. Cassandra had been contacted by the widow of a man who had recently died, and asked if she could make quilts for her children from her late husband's clothes. The lady wanted to be able to give her children something that would hold precious memories of their father, that they would treasure forever. The article was extremely pertinent as Berni's brother Steve had also recently died, at the tragically young age of 46. She asked me if I knew anything about quilting and if I could help her make a quilt from Steve's clothes. As you know, I'm not a quilter, but I had just finished making my first simple quilt for my son, so had a rough idea of how to go about it. The only slight obstacle was the fact that Berni had never sewn anything before. This didn't bother us at all - she was determined to make a quilt and I was more than happy to help her! The work involved in making a quilt can appear quite daunting, so what we did was break down all of the steps into manageable chunks. We would meet up, I would demonstrate a particular step and Berni would practise it until we were both satisfied that she could do it herself. She would then go off and work on it until she was ready to move on to the next stage. It also meant I wasn't breathing down her neck the whole time and she could achieve each step at her own pace. One of the more time consuming steps was cutting the squares out and deciding what to include. Steve's quilt is much bigger than the one I'd made - about twice the size in fact - so there was a lot more work involved. 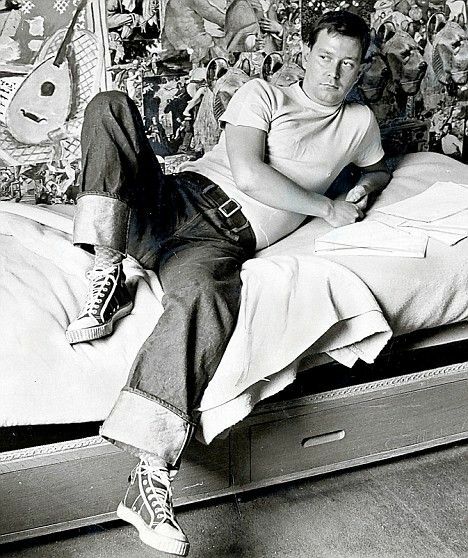 The quilt is made up of five inch squares from Steve's shirts (the checked squares) and shorts (the solid squares) as that was his signature look. Berni also managed to include a few squares that contained a pocket. This is because Steve would only wear shirts with pockets, as he needed somewhere to keep his notebook and pen! I think that's what makes this quilt so special; each square holds a personal memory for Berni and will be a precious reminder of a much loved brother. Not surprisingly, the whole process was very emotional and there was barely a session without tears, but the end result is definitely worth it. What really touches me about this project is Berni's determination. Yes, I might have shown her how to sew a few squares together and let her borrow some machine feet etc, but the work on this quilt is all hers. From never having sewn anything in her life, she's managed to sew AN ENTIRE QUILT, all by herself. Despite the unbearably sad origins, this is a phenomenal achievement, and it was an absolute privilege to have been able to help her achieve her goal. It really goes to show that anything is possible if you put your mind to it. After the endless denim talk on my blog recently, I thought I'd better show you my first (but definitely not my last!) 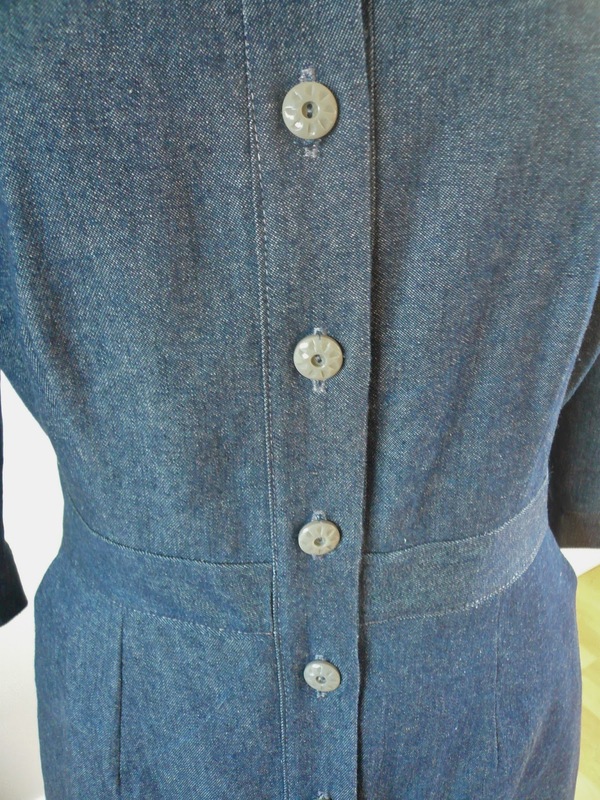 denim make of the year - a denim shirt dress using McCall's 6696. I decided on this pattern after being completely bowled over by Sew Dixie Lou's summery sleeveless version. I didn't want to wait until summer to make it though - I needed a dress that I could wear during the day with boots and tights - and that's when the idea for a denim shirt dress was born. For fabric I used a dark, dress weight denim from Minerva Crafts which I initially thought might be a bit too stiff, but it actually behaved itself perfectly whilst I was making the dress. The sturdiness of the fabric ensured everything matched up and the seams and darts were easy to press flat. The pattern was also a delight to use - I went for view D, which features a straight skirt with inset pockets and longer sleeves. I measured all the pattern pieces beforehand (as advised by Clare) and was satisfied that the size 14 would be the right fit. I also seem to have cunningly side stepped the whole issue of a FBA with this dress as the pattern allows for different cup sizes. Separate bodice pieces are given depending on the difference between your high bust measurement and your full bust measurement. Please note: the cup sizes on this pattern are NOT the same as bra cup sizes so you'll need to measure yourself carefully to see which bodice piece you need. I cut a straight size 14 all over and a C cup. The only change I made to the pattern pieces was to shorten the skirt by 2.5 inches. 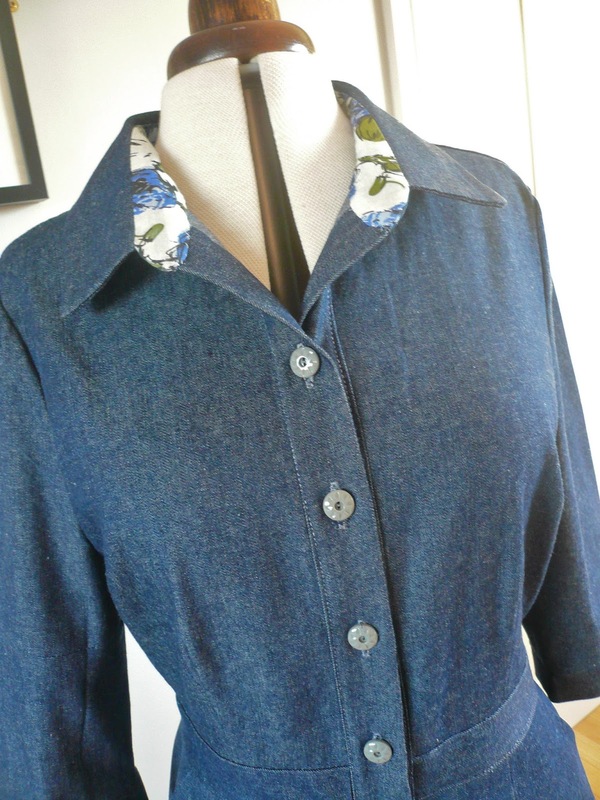 Taking my own advice from my Tips for Sewing with Denim post, I used contrasting cotton poplin (last seen on my blue rose drawstring top ) for the pockets and under collar. If I'd had a bit more fabric to spare, I would have cut the inner yoke and waistband pieces from it too, which would have made the inside even prettier. It's slightly annoying that the under collar is actually visible when I wear the dress. For some reason I was thinking it would be buttoned up to the neck. Why? Why? It's a well known fact that I hate anything too tight around the neck. I'm such a dumbo sometimes! The instructions call for the front band to be attached to the top and bottom of the dress with a few slip stitches, which wasn't going to satisfy me, The front bands and the waistband were all firmly topstitched into submission. One good thing about sewing with denim is that you can never have enough topstitching. The more you add, the better your garment looks! I'm really happy with the end result, I now have a dress that fits well, is super comfortable and made of denim. What more could you ask for?! 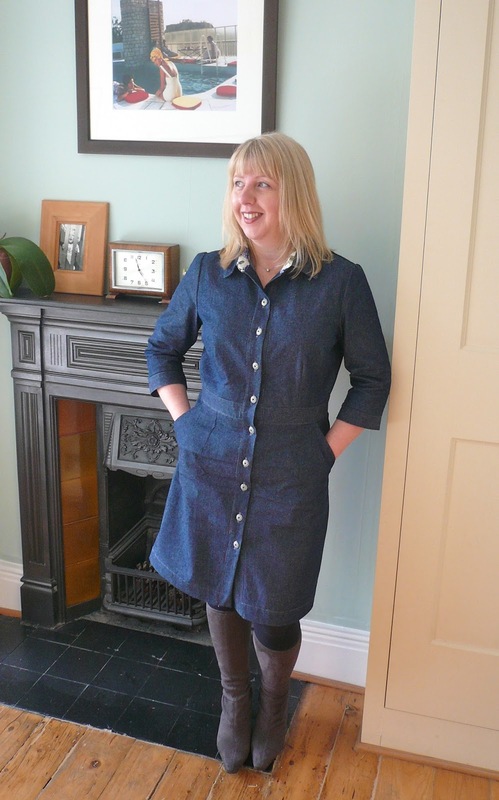 If you'd like to make a denim shirt dress of your own, you can buy a Minerva kit comprising two metres of medium weight, indigo denim (the fabric is wide so I was able to cut out the whole long sleeved dress from two metres), McCalls 6696 and matching denim thread. If you plan on top stitching the life out of your dress then you may wish to purchase additional denim thread as I ran out half way through. Thank you so much to everybody who entered my denim giveaway. I was thrilled to discover that so many of you are big denim fans and I hope my tips for sewing with it prove useful. So, without further ado, the randomly chosen winner of 2.5 metres of Robert Kaufman Railroad Denim is……Zoe from Hellozoeb!! Congratulations Zoe and happy sewing. 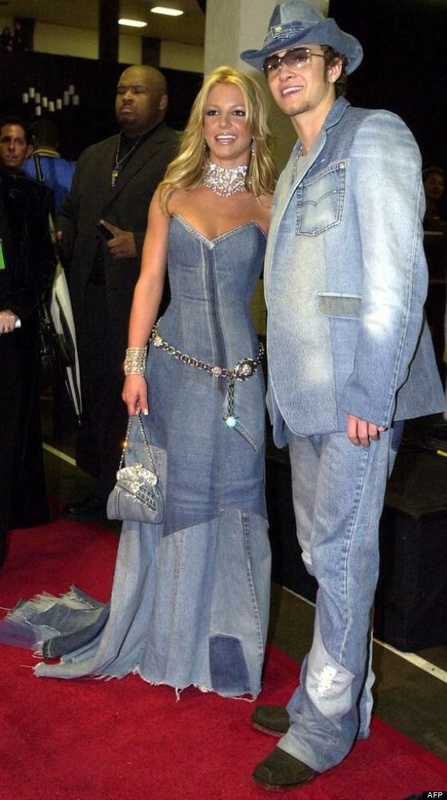 Please email me your address and I'll make sure the precious denim is sent out to you ASAP. I'd like to say a big thank you to Annie from The Village Haberdashery for so generously donating such gorgeous fabric. 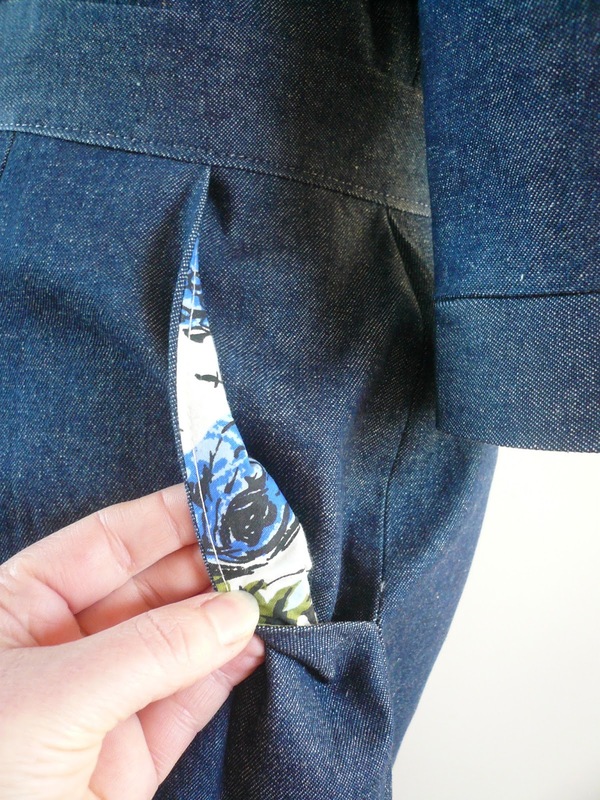 Today I've put together a few simple tips and hints on sewing with denim. 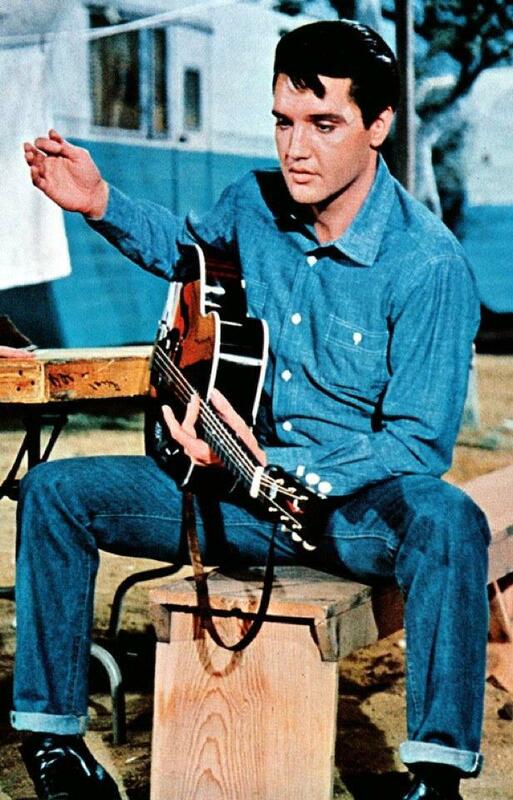 Denim really isn't difficult to work with, all you have to do is to use a bit of common sense. These tips have all worked for me with good results, so hopefully they'll work for you too. Enjoy! 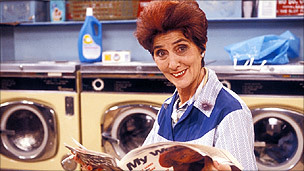 - My number one tip is to always, always, ALWAYS pre-wash denim fabric before you start sewing. Pre-washing denim will allow for any shrinkage of the fabric, and will also remove a lot of the dye that comes out on its first wash. It may sound obvious, but initially it's probably safer to wash it separately from other fabrics, unless you want everything blue tinged. Ask me how I know! - Denim can sometimes hold quite noticeable creases from being washed. Pressing the fabric whilst it's still damp will really help remove them. - Denim is notoriously prone to fraying, so there's no scrimping on seam finishes I'm afraid. Overlock or zigzag all those pesky seams as you go along, it will be worth it after the first wash, trust me! - I always use Denim or Jeans needles, they're stronger, with a sharp point and will make the job much easier. Up until now, I've always used regular thread for sewing denim and it's performed fine. For my current project however, I used Gutermann's Jeans Thread and am now a total convert. It's slightly stronger than standard thread and has a two colour effect which blends right in with blue denim. Magic! - Use a lighter weight fabric such as cotton lawn, for areas of your garment that aren't visible e.g. pockets, internal waistbands, yokes etc. If you choose a contrasting fabric these areas can become design features in their own right. - You don't need to interface areas that need support such as waistbands and buttonholes. Some of you may disagree, but I've never interfaced when sewing with denim as I find the thicker fabric already provides in-built structure. - Press all darts flat and all seams open unless absolutely necessary. If seams really do have to be pressed in the same direction then grade them. This is done by trimming them into layers so they're not lying right on top of each other. - Take your time and slow down when sewing through thick layers. If you're worried about your needle not being able to cope, then use your hand wheel for difficult/bulky areas. - One reason needles break is because the foot tilts at an angle when encountering thick layers or seams. An easy way to counteract this is to keep the foot level. To do this, just fold a piece of denim to the same thickness as the seam or hem you need to sew through and position it behind the foot. This will keep the foot level and not put any stress on the needle. See how the foot is forced to tilt at an angle? - When you get to the end of the seam, remember to position the folded denim in front of the foot to prevent the needle angling down again. Easy peasy! I hope these tips prove useful and if you have any additional gems of your own for sewing with denim, please let me know in the comments section. We're not finished with denim just yet in this post though. Oh no! 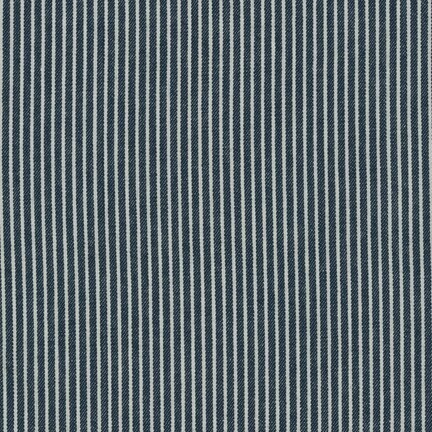 To set you up on the road to denim enlightenment, Annie from The Village Haberdashery has very generously offered one of my readers 2.5 metres of this gorgeous striped Railroad Denim by Robert Kauffman. Isn't it fab?! I can really see this as a cute A line skirt worn with coloured tights, or a fitted blouse. To enter, just leave a comment on this post telling me what you'd make with the Railroad Denim if you won it. You can also get an extra entry if you follow The Village Haberdashery's Daily Stitch blog on Bloglovin'. Just let me know in your comment if you're a new (or existing) follower. The giveaway is open worldwide and closes at midnight GMT on Wednesday 22nd January. The winner will be chosen at random. Do you sometimes feel like a sewing project is bewitched? My vintage raincoat started out so well but has gone rapidly downhill over the last few days. This morning, I attempted to attach the sleeves SIX TIMES before finally admitting defeat. Luckily, I took a deep breath, stepped away from the offending raincoat and ordered more fabric to redraft the sleeves. The alternative was to slash the entire thing with scissors, which would have made me feel better - but maybe not for long. So, instead of working myself into a frenzy about a pair of crappy sleeves, I've decided to immerse myself in my next project, which will be sewing my denim shirt dress. Hoorah, even just typing that sentence has brightened up my day. I know for a fact that this dress will be a well worn staple in my wardrobe - and that's before I've even made it. How do I know this? Well, everything I've ever made from denim (my Ginger skirt, Kelly skirt and stretch capri trousers) has been worn and worn to death. 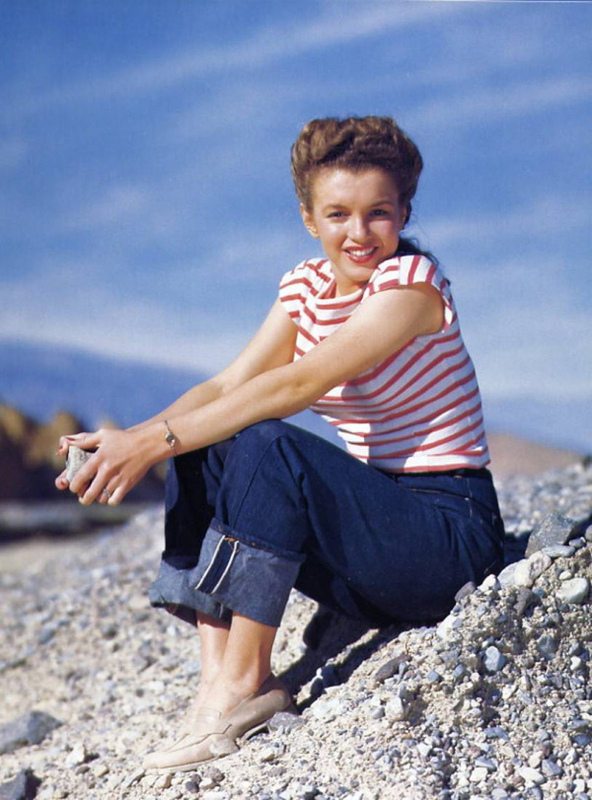 Perhaps it's because denim is quite forgiving in fit (especially stretch denim) and tends to mostly flatter the wearer. It's hard wearing, long lasting and doesn't show the dirt, so you can wear your denim items until they're virtually standing up on their own with grime. I love sewing with denim and am in the process of putting together a 'Tips for sewing with denim' post, which I'm hoping will be useful to some of you. In the meantime, let's feast our eyes on a few highs and lows of this wonder fabric. 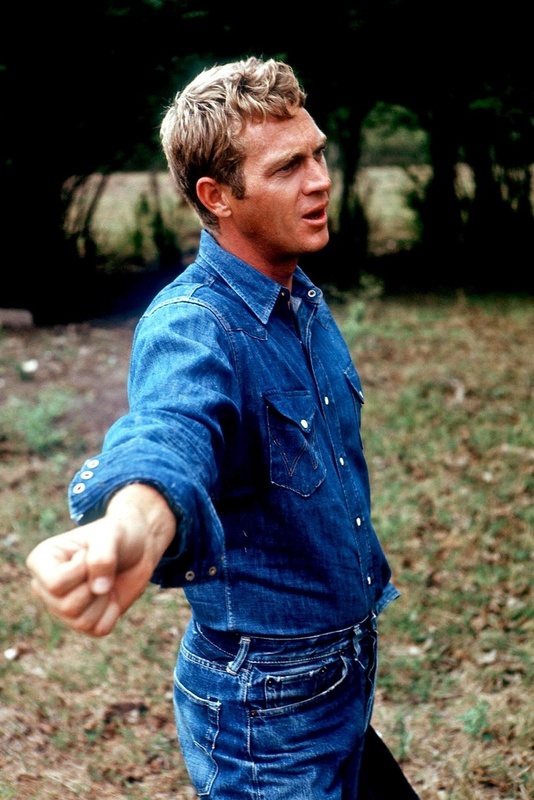 Historically, denim's durability and strength made it a popular fabric with manual workers such as cowboys and miners. 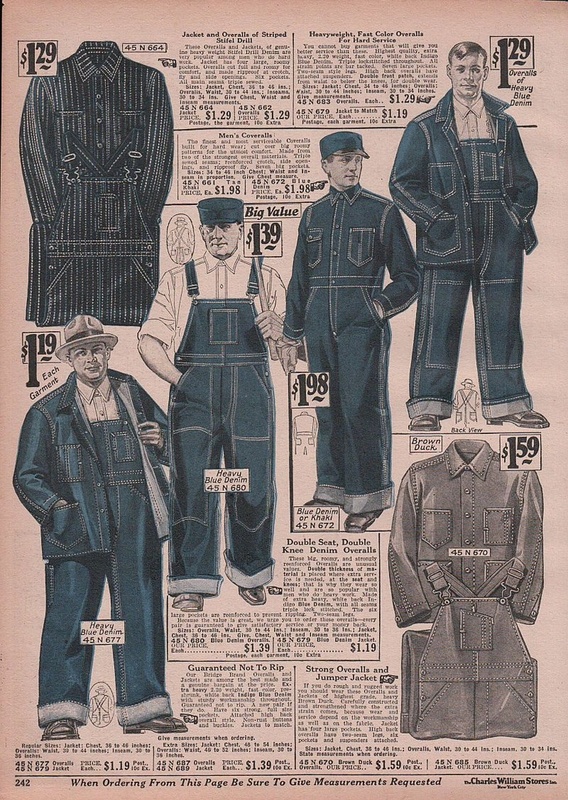 It was also perfect for workwear in the form of overalls or dungarees as it protected the clothes worn underneath. 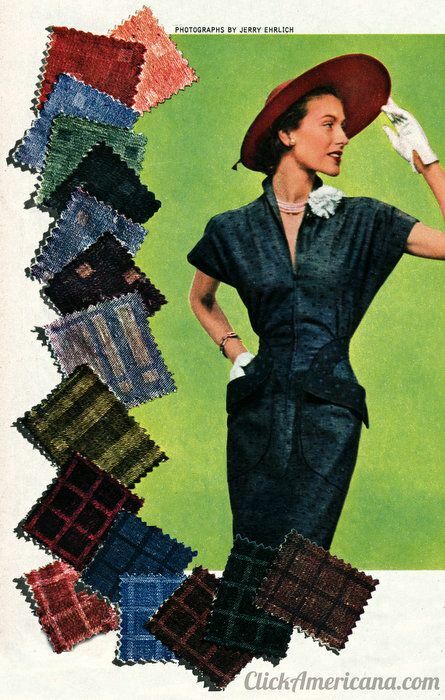 It started to become more popular in the 1950's and was even advertised as a dressmaking fabric. I had to look up the word "sanforized' from the ad below, but apparently it means, "to preshrink a fabric using a patented process." Most of us are perfectly content to wear one item of denim clothing at a time and this look, in my opinion, is effortlessly stylish. For some however, this isn't sufficient. and they feel the need to wear it on both their top and bottom halves. 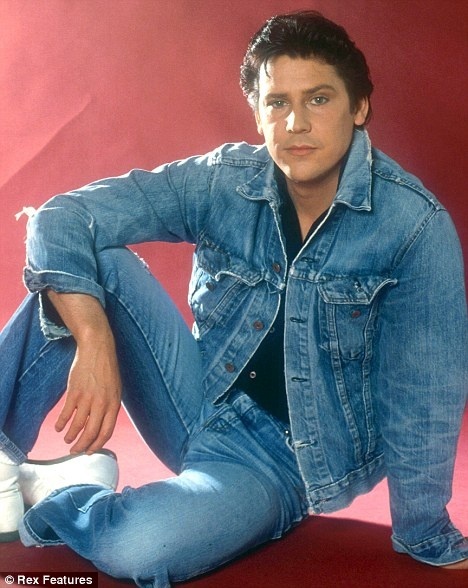 Otherwise known as 'double denim', this is a dangerous fashion territory in which to wander, and there are only a fabled few who can artfully pull off this difficult look. After the success of my last Peony dress I'm hoping the Emery dress by Christine Haynes will produce a similar shape. Ooh look, a bow! And a collar!! The Penny Pinafore is a fab looking princess seamed knit dress and the second pattern release from Kitschy Coo. I've been living in knit dresses over Christmas so this will be a perfect new addition, maybe in a brightly coloured double knit? 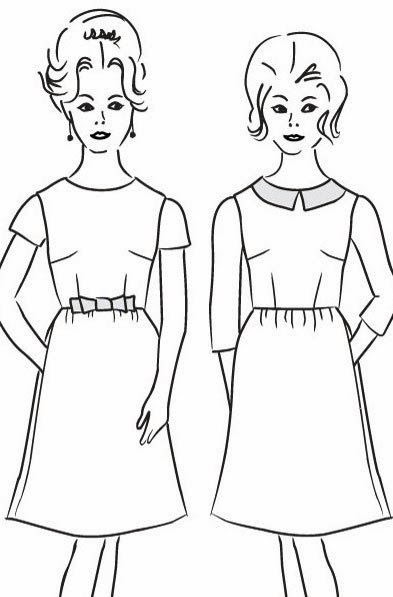 There's hardly any occasion (actually change that to no occasion) where I would be required to wear a slinky party dress, but how can I not make the Georgia dress from By Hand London?! I have a cunning plan to make a dress version of a pair of jeans, which for me would be a denim shirt dress. I can't believe I haven't made one already actually as I love shirt dresses and I love denim skirts. The combination of the two almost has me passing out with glee! McCall's 6696 is my pattern of choice. So they're my first four dresses of the year, with many more to come I'm sure. As far as improving my dressmaking skills go, I have just the one thing on my list - master the full bust adjustment. Or to be more accurate, actually do a FBA, the only reason I haven't done one before now is pure laziness so there's no excuse really!